The idle speed is controlled by the electronic throttle control system. The electronic throttle control system is comprised of: 1) the one-valve-type throttle body; 2) the throttle actuator, which operates the throttle valve; 3) the throttle position sensor, which detects the opening angle of the throttle valve; 4) the accelerator pedal position sensor, which detects the accelerator pedal position; and 5) the ECM, which controls the electronic throttle control system. Based on the target idle speed, the ECM controls the throttle actuator to provide the proper throttle valve opening angle. The idle speed continues to vary greatly from the target idle speed (2 trip detection logic). 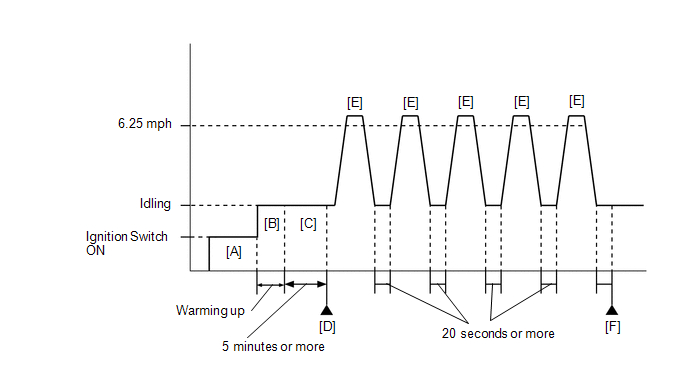 The difference between the target engine idling speed and actual engine idling speed exceeds the threshold and the IAC flow rate learned value is stuck at the upper or lower limit for 5 seconds or more. 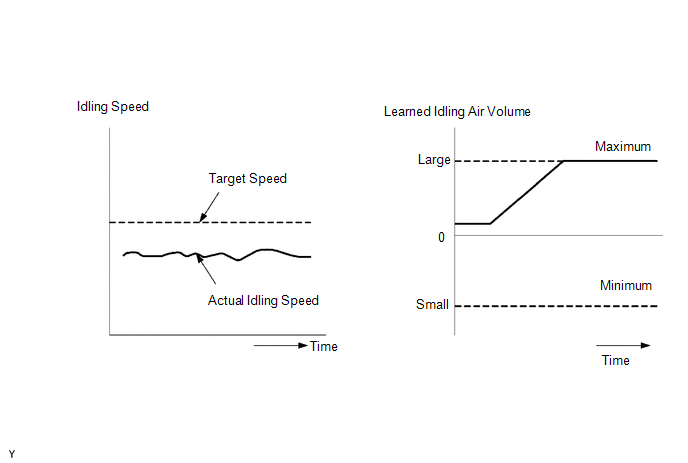 After driving at a vehicle speed of 10 km/h (6.25 mph) or more, the difference between the target and actual engine idling speed exceeds the threshold 5 times or more during a driving cycle, and then the system determines that the IAC flow rate learned value is stuck at the upper or lower limit, or that the IAC flow rate learned value has been changed by an amount that exceeds the threshold. Start the engine and warm it up until the engine coolant temperature is 75°C (167°F) or higher with all the accessories switched off [B]. Accelerate the vehicle to 10 km/h (6.25 mph) or more, and then idle the engine for 20 seconds or more [E]. Repeat step [E] 5 times. Enter the following menus: Powertrain / Engine / Trouble Codes [F]. (a) Check the throttle valve condition.